Notes: Written and directed by Kenji Kamiyama. 2020 Japan, just prior to the Tokyo Olympics: Kokone Morikawa lives with her dad, who does freelance electronics repair out of their home. (Her mom, we're told, died in an accident.) She frequently falls asleep, and has elaborate dreams, based on stories her dad told her, about a place called Heartland and its Princess, a girl named Ancien who had the magical power of bringing machines to life. Kokone's life is soon turned upside down, however, as her dad gets arrested, and her waking and dream lives are suddenly blended- including being pursued In Real Life by a man who looks exactly like Heartland's villain. 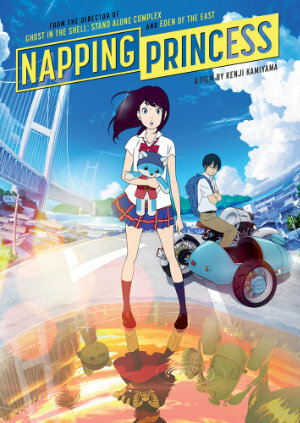 Napping Princess is certainly currently relevant. A main focus of the story is self-driving vehicles, which the show seems to advocate for (or at least it advocates for CHARACTERS that advocate for self-driving vehicles.) From what I've heard IRL, aside from some fatalities, another issue that might stand in the way of popular acceptance of this technology is loss of a feeling of control (the same reason people are more fearful of air travel than auto travel, even though statistically one is much more likely to die in an auto accident than in a plane crash.) On the other hand, the show does seem to imply that Kokone's own "natural" dreams might be superior to the products of someone ELSE'S imagination that are being viewed in the V/R goggles of her friend Morio, a young man she recruits to help her. The problem with "near future" sci-fi of this sort is that it will inevitably become "dated" by real-world events. It DID seem incredibly stupid for Kokone to be communicating with her absent "dad" on his phone when she really didn't know WHO was actually holding that phone. It also strains credulity that Kokone was able to pull off that business in the airport, in front of two employees who- as air travelers are constantly reminded- are always on the lookout for just that sort of thing. Where Kokone's dreams and reality cross paths, the show kind of wants to have things both ways, offering us evidence that the "magic" in her dreams is influencing the real world on the one hand, but then also offering a NON-magical explanation on the other. A critical section of the story is shown in "Heartland Mode", which made it hard for me to precisely know what was happening at this time in OUR reality. Recommended Audience: No fanservice. Mild violence, and trauma surrounding the loss of a parent. I can't find an MPAA rating on the box, but I'd say about PG.